You see, we were only ever pretending to start a magazine. We were also pretending to start a collective, a pretend movement, a pretend religion, a pretend political party, even a pretend society. We were planning pretend radio, pretend gatherings, a whole magical emporium of pretence. Thrills, spills and magic surprises. Since pretence has no conventional limits, we allowed our imaginations to aim high. But the real thing about all of our pretence, was our intent to conduct an experiment in guerrilla surrealism and gather momentum for a large scale act of poetic terrorism. If we are honest, it’s a twisted, absurdist joke that got carried away with itself; the product of some very strange and deluded imaginations; an attempt at starting some quantum chaos magic in true Discordian fashion; possibly a collective acid flashback, manifested in print; or perhaps just our own kind of laughter therapy. But it’s a joke that has strangely become a reality. And the story of how this pretence got started – and where it’s got us so far – warrants telling to all of you who pretended to be interested. You see, this whole pretence got started amongst earthquakes and riots. But it wasn’t just the riots that made us want to pretend like we could do something. It was a decade of oil wars; economic injustice; media corruption; systemic political rot; that feeling of being a cog in a very big hungry machine; and, last but not least, the state of civilisation generally that was getting us down. And this summer it felt like some dark chaos was affecting us all, up close and on a subconscious level. We needed to lighten our mood and free our minds. We’ve visited too many sensitive friends in the local psychiatric ward this year. And listened to countless others feeling angry, depressed, helpless, anxious, not quite at ease with the world around them, unable to put their finger on quite what it is. We came to the thought that what’s happening is that those who are still in tune with our collective consciousness enough to listen to it, feel so burdened by the urgency of its message, it drives them a little bit crazy. Or maybe we’ve all just taken too many psychedelic drugs, read too much sci-fi or fallen for too many 2012 prophecies and conspiracy theories. That’s the rub, isn’t it? We never can be sure which. The paradox is that the tools and concepts we’ve used to open our minds are the very things that cause us to mistrust ourselves and allow us to forgive our own apathy. They sow the seed that we might just be going a little bit mental, blame those funny mushrooms and scary movies. But what if we’re not? We speak from experience. Pretend Magazine became the vehicle for our collective existential crises, born from a feeling of just wanting to DO something after the riots woke up our inner revolutionaries and we realised we’d all been far too apathetic for far too long. But what could we do? We’re not politicians. We’re not global economists. We’re not wealthy businessmen or spiritual leaders. We’re just an average bunch of friends, loose acquaintances and petty raconteurs, all of us possibly just one step away from the asylum. By day, we do a good job at pretending to be normal. We pretend to be waiters, chefs, gardeners, web designers, shop assistants, marketers, librarians, office workers, dealers, parents, corporate whores. You name it, we’ve pretended to do it. But by night we are tortured creative sorts – pretending to be musicians, artists, photographers, writers, gonzo philosophers, amateur alchemists and thinkers. 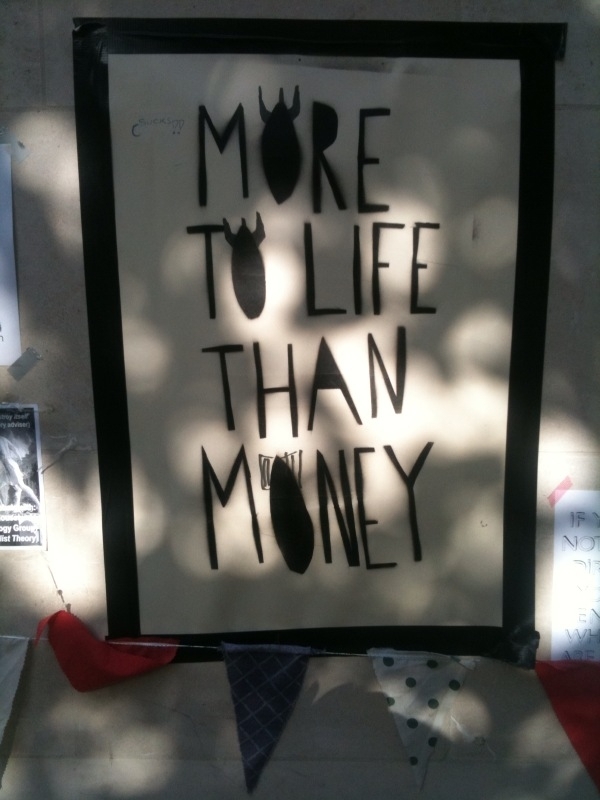 Pretending there’s more to life than money and searching for the answers to life’s big questions. We found ourselves inspired by the thought that that if we can pretend to be all those things, we might as well start pretending we could use creativity as a force for change. We stumbled together as a gathering of like minded lunatics after spirited pub conversations and strange synchronicities reminded us that we’re not alone in our daily pretence and that anything is possible. That the pen is mightier than the sword. That life imitates art. That we create our own reality. That laughter is the best medicine. That clichés are boring but they make a point. What we share is a sense of childish mischief, an anarchistic spirit, a belief that change can only start with ourselves and that, if there was ever a time to try to set change in motion, it is now. So we set our absurd, surreal thoughts into print and we hatched a plan. The very fact that you are reading this newsletter means the plan worked… in a way. But taking it to the next level is where you come in. 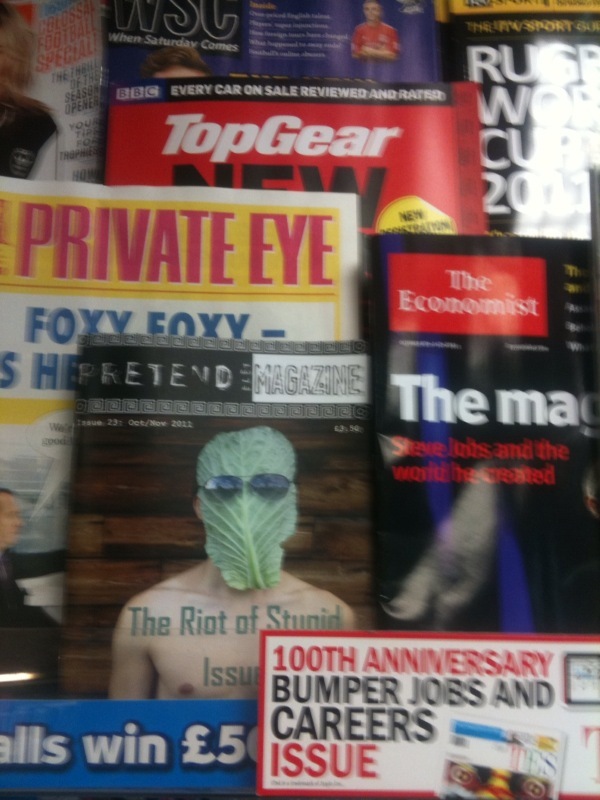 Our plan was to construct a meme bomb, posing as a magazine, in the hope we could start a pretend revolution. No humble ambition, admittedly. But, like we say, we’re only one step away from the asylum, or from victory, depending on your point of view. What’s a meme bomb? Difficult to describe. A meme is a message that evokes a mental charge, ripple or spiral in the mind of the recipient. It’s an art, not a science. Meme bombs challenge social assumptions, break social protocol, disrupt inner dialogue. We’re all exposed to memes every day – by clever advertising campaigns designed to trick you to go out and buy stuff, to keep playing your part in the big machine. So we wanted to take a stand against this mind control. To do something provocative, surprising, out of the blue. Because life is truly quite absurd, but with a little effort we can make it ridiculous. And we’re not talking about an average revolution either, just the quiet, subtle revolutionary act of reclaiming our own minds… peacefully freeing our thinking from the trivial distractions of modern life… allowing space for new thoughts and the radical ideas that might actually help us find some solutions to our angst. And to invite as many people as possible to join us. 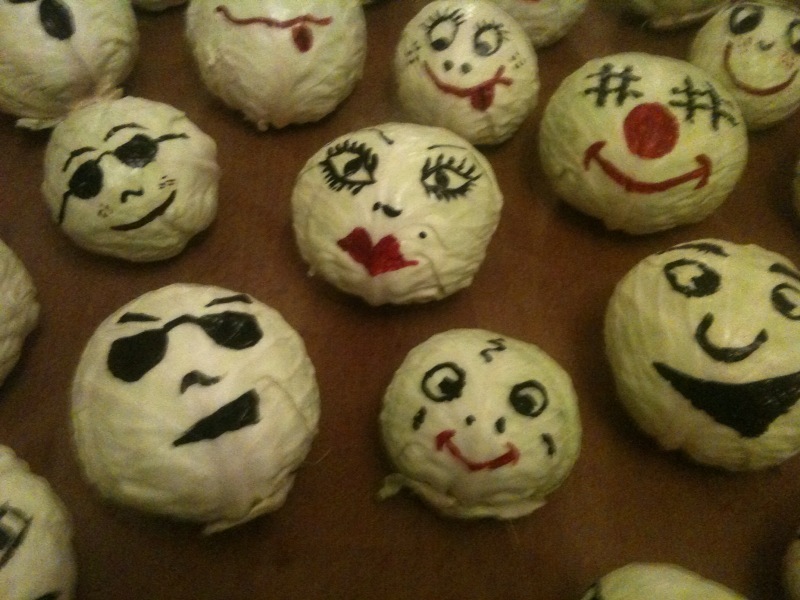 Our original aim was to reach enough fellow creative Machiavellian types to gather momentum for some large scale acts of culture jamming; wholesale random poetic humour, mostly involving cabbages and awakening them. Not in a patronising way. We’re all cabbages aren’t we? 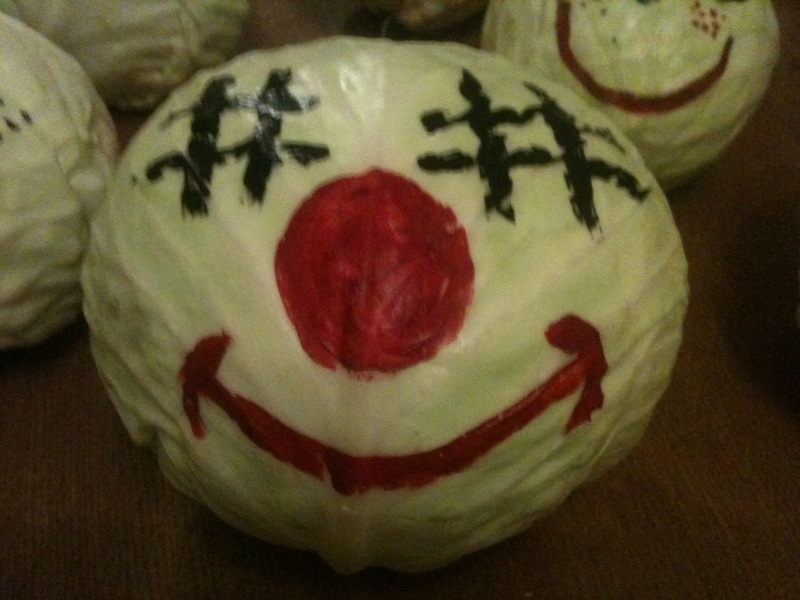 But the plan was to reach enough awakened fellow cabbages to actually create some kind of coherent message and a creative forum for change… or pretending to anyway. And once we set about creating it, the thing generated an energy of its own. Before we knew it, we were gathering contributors, laying out pages and going to print. It was like we were possessed by an Erisian muse and she was in a hurry. So we surrendered our sanity to it, and the sacrifice seems to have paid off. Our surreal dream has become a reality, and proved that our theory of pretend quantum chaos merits further experimentation. We’ve created a pretend monster without meaning to. You see, we’ve been creating this strange kind of cabbage chaos since August. We found a friendly printer which meant we could print thousands of our pretend magazine, so long as we sold a few to cover the print run. The rest we could use as the media memes they were intended to be… left surreptitiously in cafes and waiting rooms, mysteriously appearing at bus stops and on park benches, discarded on trains, buses and planes or strategically placed in ridiculous locations. And, so far, we’ve had some hysterical results. In the four weeks since we went to print, we’ve succeeded in getting our absurdist, culture jamming joke on newsagents shelves next to the Economist, Private Eye and Heat Magazine. We’ve sold enough copies to just about cover it that way, which makes us smile… muchly. We’ve even managed to get it on local TV news and in the hands of both the General Secretary of Unite and Kryten from Red Dwarf. He was one of our favourites. He joined the B-Physical fitness camp for an early morning run, before being taken to the Coach and Horses for a much-needed drink. Hats off to the B-Phyiscal crew for playing the game. We’ve created enough moments of random cabbage contemplation to warm the coldest of hearts. And enough of you curious readers (over 300 of you altogether!) have joined the mailing list or facebook page to make writing this newsletter seem suddenly worthwhile. You see, as we were busy putting the finishing touches to our maniac’s magazine, we looked up from our tom foolery to discover that the revolution we’d so badly wanted to start was already happening. 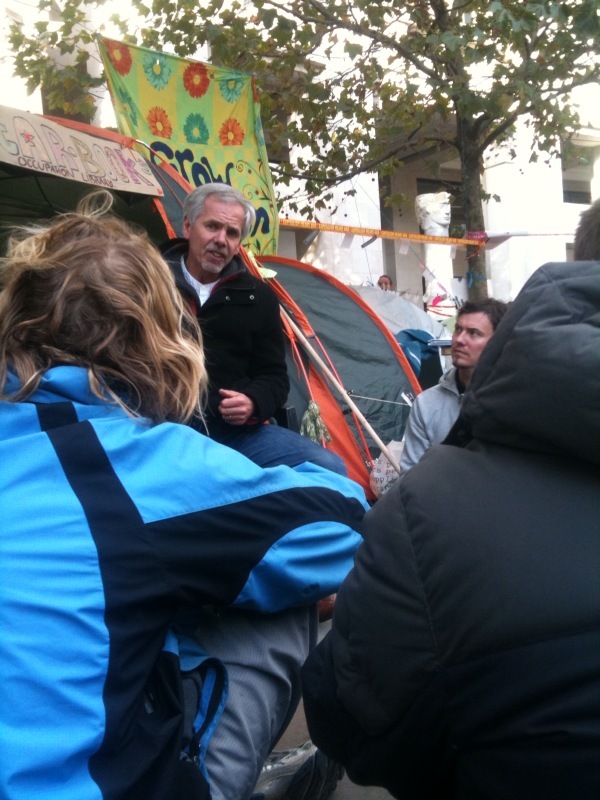 The Occupy Movement had taken hold in Wall Street, and plans were being mooted for the Occupy London demonstration on the 15th October. We were awed by the synchronicity, abandoned the notion that we were all just going mental, and headed down to London with a suitcase full of cabbages and Pretend Magazines to take our guerilla surrealism to the next level. 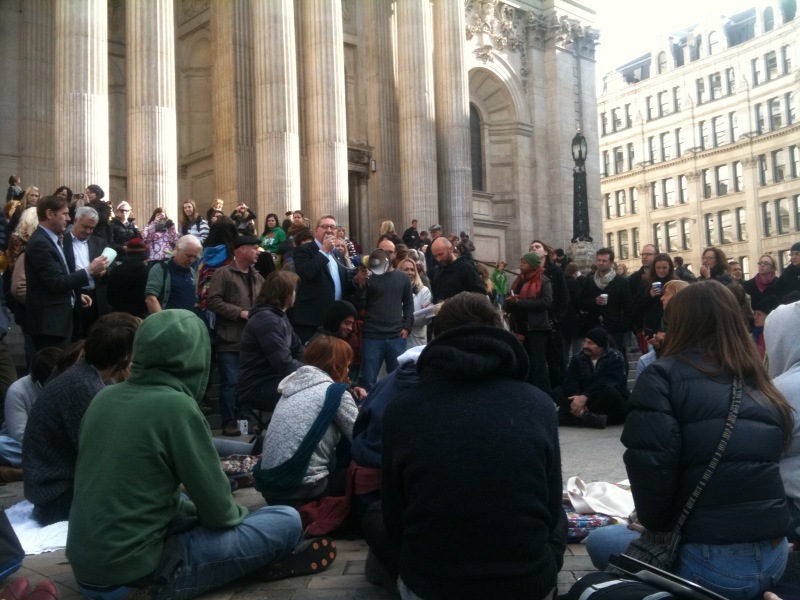 We spent a few days on the steps of St Pauls, as part of OccupyLSX. When we weren’t debating the politics of change and the shape of a sustainable global economy with fellow members of this inspirational gathering, or watching true democracy unfold in the movement’s general assembly, we were helping out at the info tent, sneaking our memes into the pockets of bankers and random passers-by, distributing cabbages in strange locations, expanding our pretend network and hatching a plan for what to do next. The encounters we shared on the steps of St Paul’s have left us feeling utterly changed, inspired, hopeful and enlightened. The revolution HAS started – it’s got legs, it’s got hope and it’s got the support of millions of people who can’t be in London right now to make themselves heard. The same passionate spirit that brought this Occupation about is what drove us to create our crazy magazine. If you needed an example of the power of collective consciousness, proof that a critical mass of awakened human beings is close to being reached, you will find it there and in the myriad of occupations taking hold all over the world. But the movement has many obstacles to overcome. Media misrepresentation is just the most obvious. If you watch the news, it’s easy to be deceived that what’s going on in occupied cities around the world is just a bunch of “hippie proto fascists” looking to bleat and cause disruption. But this is most definitely not the case. The movement is made up of rational, sensible human beings from all walks of life, simply making a stand for some positive change. They’re speaking for all of us and it’s important we all add our voices to the chorus. The steps of St Pauls have become a true public forum for intelligent, informed debate about the state of world politics, our environment and our global economy. Normal, passionate people, prepared to be the change they want to see, are meeting, sharing and critiquing their ideas, engaging all points of view, and taking small, carefully considered steps towards reaching a consensus and imagining what a better world might look like. We met bankers stumbling home from work, full of Dutch courage, telling us the protest is doomed to failure because it doesn’t know what its demands are, it has no coherent requests. And until we can all agree what the change looks like, we’ll never get it. There’s so much work to be done to stop these metaphorical beatings and engage the conversation. And we can’t all get to St Paul’s each week to do it. So we’ve spent the past few weeks back home, pondering where this absurd joke’s got us, where it should take us next, and how we might use the surreal spirit of Pretend Magazine to help the real, important work of the Occupy Movement. So here’s where we need you! Evidence and instinct suggests that our meme bomb magic and guerilla surrealism actually works and there might be some more fun to be had from it. It’s confirmed our belief that we can create our own reality and creativity can cause change. In the four weeks since we launched, the number of Pretenders who’ve shown an interest in this odd idea have grown from its half dozen faceless founders to over 300. If we can apply these stats on a bigger scale, then we’ll soon have enough people on board to commit some large, coordinated public acts of random strangeness, which was our true mission in the first place. This means that, first of all, we can make the magazine available for everyone to download as a free PDF here. Please take a look at it, bearing in mind everything you now know, and tell us what you think. And share it with anyone you think might be interested in our experiment. We’ve realised we might have been a little aggressive with the cabbage theme, might have offended some folk, might not have made our message or our good intentions clear enough. Not everyone got the joke, and we’re sorry to anyone left feeling a little confused by it. So, now that we’ve made our game explicit and you can see Pretend Magazine in a whole new light – as an act of guerilla surrealism – the question is, do you like the idea enough to get involved? 1. Be prepared to take part in an act of peaceful poetic terrorism in support of the Occupy Movement. Would you? We’re not sure what yet, but it will be legal, beautiful and funny. It should happen simultaneously in every town and city around the UK, like a flash mob but better – and we’re open to suggestions. A gentle, united message from everyone who cannot be in London to let the movement, the media and the politicians know that the call for change comes from all of us here in the provinces too. Like thousands of yellow meme bomb helium balloons let lose in banks and shopping centres. Or hundreds of people dressed in yellow creating ridiculously long queues in banks by asking moral and philosophical questions of the counter staff. If you’re up for taking part and creating some pretend magic, please send a message to info@pretendmagazine.co.uk including any good ideas you might have yourself. Then forward this email to as many friends as possible, paste it into your facebook status, and let’s try to turn this assortment of 300 people into 300,000 over the next few weeks. Anything’s possible, after all. 2. Help us continue our meme bomb surrealism with the first issue of Pretend Magazine. We didn’t like selling our magazine. It felt wrong. And so now we’ve paid the bills, we want to use the issues we’ve got left to continue the joke. We’ve created a page here where you can still go and order paper copies of the magazine, but with a different intention in mind. Here, you can get three copies for a quid. This just about covers the postage for sending them out to you by mail, ideally for you to keep one and leave the other two in the silliest places possible. Why would you want to do that? Purely for the fun it. Leave them on your boss’s desk, in the waiting areas of banks, or on supermarket shelves – just to cause confusion. Use your imagination. 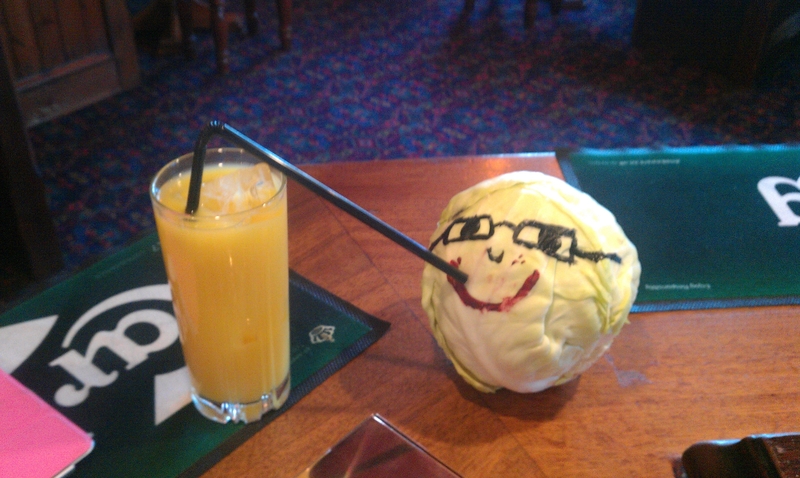 We found all our own acts of cabbage silliness have left us feeling warm inside. And that’s got to be worth a quid! Or, if you don’t have a quid, or a pay pal account, but still want to help, just email your address to us and we’ll send you free magazines in return for your commitment to perform secret acts of silliness. 3. Contribute to the next issue of Pretend Magazine. We’re leaving the detail to chance and chaos magic once again. It’s what has got us this far. But we need more contributions, more feedback, more voices. Tell us what you think about this strange surreal joke. Was it even funny? We had a laugh. But shall we carry on and see where it leads? And will you join in?